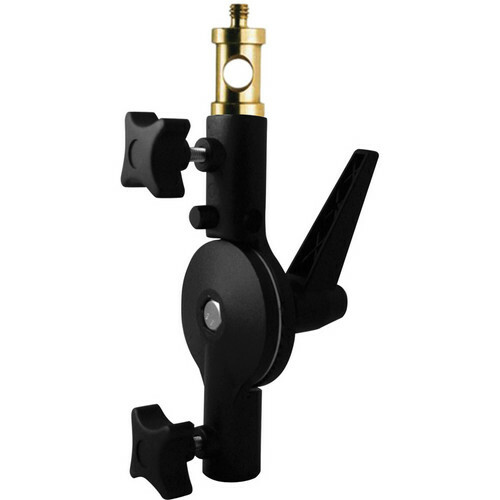 The Westcott Tilter Bracket with Brass Spigot is a heavy-duty cast aluminum alloy bracket featuring a universal mounting adapter for attaching to nearly any light stand. The brass spigot incorporates a 1/4"-20 mount on top and an umbrella receptacle for versatility. Additionally, the adjustable locking handle, wide tilt angle, and oversized knobs add to its overall functionality. Box Dimensions (LxWxH) 4.8 x 3.9 x 0.3"
Tilter Bracket with Brass Spigot is rated 4.4 out of 5 by 5. Rated 4 out of 5 by Bonedome from Will change your life Okay it won't actually change your life. I mean, it's just a tilt bracket for pete's sake. But it's metal (except for the plastic knobs) and works predictably. Doesn't feel as nice as higher-end products that do the same thing, but it doesn't cost as much, either. It has teeth-type things that work to sort of lock it in place, so you're not just relying on friction/tension from the lever. Works fine, and is a useful addition to your lighting-gear miscellaneous parts bag/box. Rated 3 out of 5 by Anonymous from Tricky screws For the price, the item was ok. I purchased 4 of them for a shoot. Three of them worked fine. However on the fourth one, the spigot's screw snapped off inside my Icelight the first time I used it. While I don't think I was too rough with the bracket, it was a bit of a chore to get it removed form the light. I called B&H for a new one and was directed me to Westcott who replaced the item. Rated 5 out of 5 by Sherwin L. from Perfect compliment to the Ice Light This is great for studio use when you're on stands and not handholding the Ice Lights. I have 2 of these to compliment my two Ice Lights 2s that I recently purchased. Rated 5 out of 5 by James from Perfect for Icelight Strong. Stable. Easy to use. Want more do you want. Excellent piece of gear. I'm new to studio lighting, so bear with me. How does the bracket work. Twisting the armature doesn't seem to cause the bracket to articulate in any way? Stuart, Loosening the bracket by turning the arm counterclockwise should allow you to rotate the top of the bracket clockwise from about a 7:30 position around to 5:30. In addition, loosening the top thumbscrew should allow a 360 degree rotation of the spigot. You can also adjust the arm by pulling it away from the bracket and re-positioning it. Will this product allow me to tilt my wescott apollo softbox? This video shows a tilting set up using the tilter bracket and the telescoping section of a background stand https://&lt;a href= http://m.youtube.com/watch?v=zeyAv2EYc9Y. target= _blank &gt;m.youtube.com/watch?v=zeyAv2EYc9Y.&lt;/a&gt; I prefer a similar setup using an Illuminator Arm extreme combined with the shoe mount bracket. What is the hole for in the spigot? I've used the hole a few times to tighten, using a screwdriver or hex wrench. Avoid excessive tightening. I use it with a seven foot umbrella and it works great! It will last forever.